A quarter century ago the music industry was confronted with a new threat – cassette tape recorders. These devices were able to make “near perfect” copies of any audio recording and the RIAA and others feared this would be the end of the recorded music industry. The record labels took their fears to Congress, which eventually resulted in the Audio Home Recording Act (AHRA) of 1992. Under this law importers and manufacturers have to pay royalties on “digital audio recording devices,” among other things. The legislation also applies to some newer recording devices common today, which is now causing trouble for Ford and General Motors. 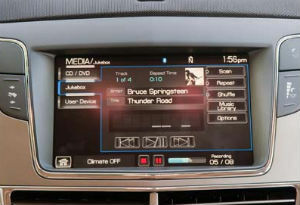 Both companies ship cars with the ability to rip CDs onto internal hard drives and according to a coalition of artists and record companies this violates copyright law. The Alliance of Artists and Recording Companies (AARC), which lists major record labels and 300,000 artists among its members, filed a class action lawsuit on Friday in which they demand millions of dollars in compensation. “While no one likes litigation, Ford, GM, Denso, and Clarion have stonewalled long enough, and we are determined to collect the royalties our members – and all artists and music creators with rights under the AHRA – are owed,” Bocchi adds. The artists and record labels are looking for both actual and statutory damages, which could amount to hundreds of millions of dollars. In addition, they want to prevent the manufacturers from selling these unauthorized devices in their cars. The case will prove to be an interesting test of the legality of “recording” devices in car entertainment systems. As is usually true, the law is not as black and white as AARC’s complaint states. For example, the lawsuit doesn’t mention that the Audio Home Recording Act includes various exemptions for personal use and for recording equipment that’s part of a larger device, such as CD-burners in computers. It’s now up to the court to decide how cars fit into this picture.